Analyze, share, and execute investment ideas faster. To find opportunity anywhere and act on openings faster takes data that goes beyond the conventional and an intelligent, predictive system that can help you go from decision to trade first. FactSet's portfolio management and trading solutions combine the best in OMS and EMS with the unique company and portfolio insight only FactSet can provide to transform the way you discover, decide, and execute. Gain an end-to-end portfolio management solution. Rely on a comprehensive monitoring and simulation platform designed specifically for portfolio managers. Gain up-to-the-second insights into your portfolio performance, exposures, risk, and composition. Simulate trades without triggering compliance workflows to thoroughly test ideas without creating an unnecessary audit trail, then check compliance rules directly when you’re ready to execute. 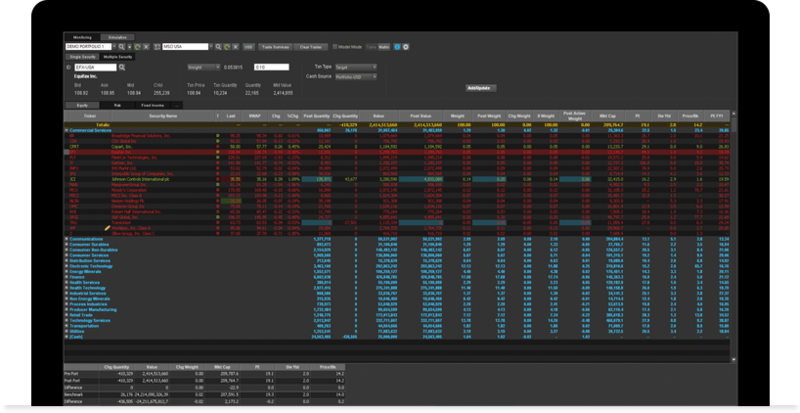 Quickly test ideas by simulating individual or multiple trades at once, and by allocating trades to up to twenty portfolios at a time to see their real-time impact on risk. Easily submit tested trades to your OMS for order entry and compliance. Gain a performance advantage powered by real-time news and insights. Quickly review relevant, real-time insights about the companies and markets you care about, without the noise around the ones you don't. Review stories and summaries generated by industry professionals and pulled from global news sources. Rely on custom alerts, powerful filters, and scheduled overviews to ensure you're notified of relevant news as it happens. Learn how to plan for the shift from active to passive management, improve performance, and attract new business in this free guide. 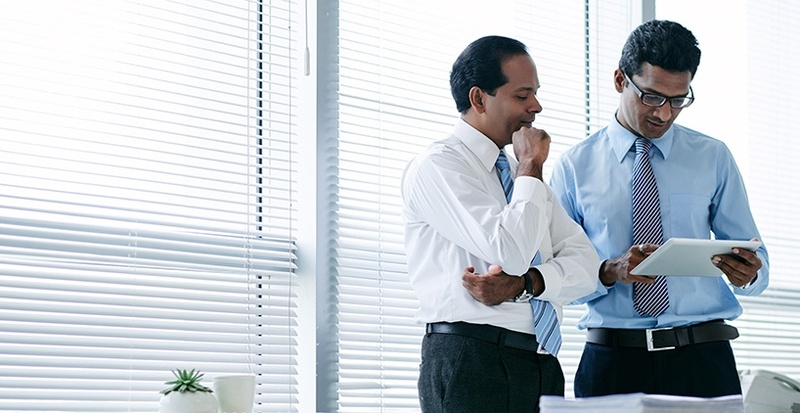 Connect the front office with seamless integration and collaborative tools. 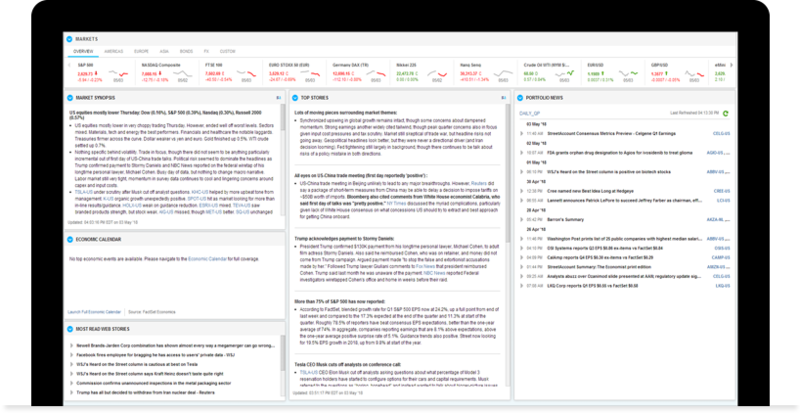 Get traders and portfolio managers on the same page with FactSet's turnkey integration of your firm's proprietary holdings, transactions, and analyst research with our content and expansive data sources. Rest assured that data and information is consistent and synchronized for users across your firm. Incorporate extensive benchmark data and global exchange indices, global news coverage, and other sources of critical information with our unique suite of applications, including our execution management system. Leverage unique content to monitor macro and geopolitical trends. 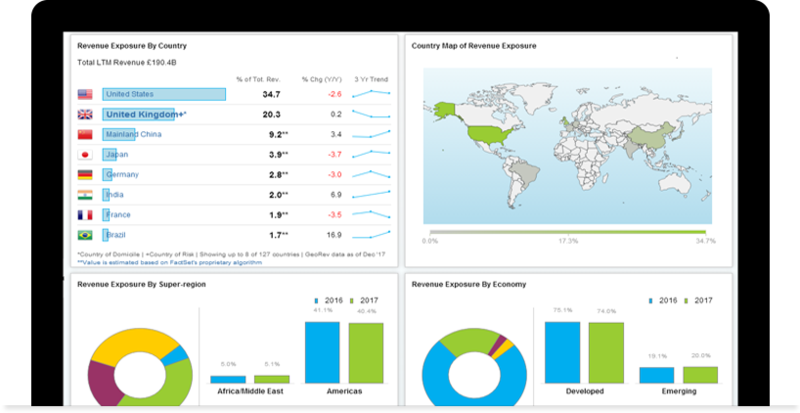 Differentiate your investment process with unique data that helps you stay ahead of market trends. Segment companies into highly specific, precise categories according to primary focus. Understand your portfolio’s true exposure to geopolitical risk, macroeconomic factors, and market conditions, or uncover interconnected relationships within your stock portfolio that may affect overall performance. 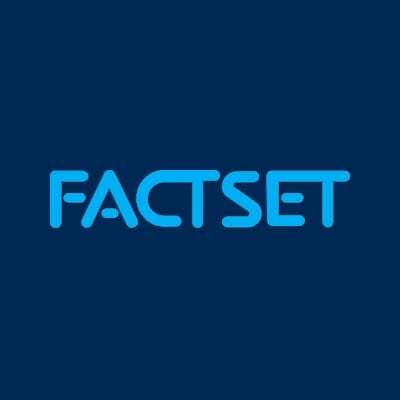 FactSet’s global coverage and unique content takes you beyond the standard data sets to find an edge. Harness powerful analytics to assess risk and performance and simulate trades. Understand risk performance at the total, sector, and security level, relative to a benchmark using FactSet’s cutting edge portfolio management platform. Gain a rich understanding of historical risk and performance with an industry-leading portfolio analytics that lets you simulate trade ideas, project the impact of future market events by defining stress tests and yield curve scenarios, and shock spreads over different horizons. Engage machine capacity with human skill. 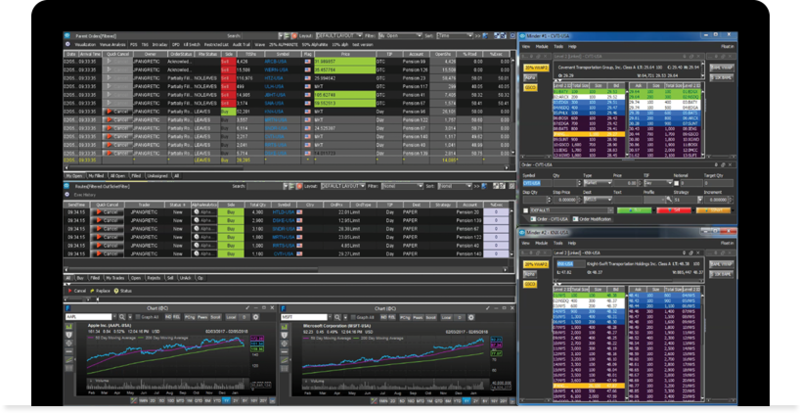 Streamline your trading workflow with full integration between your FactSet applications and EMS. Complete the portfolio lifecycle with optimized algorithm selection and automated trading using FactSet’s trading solutions. 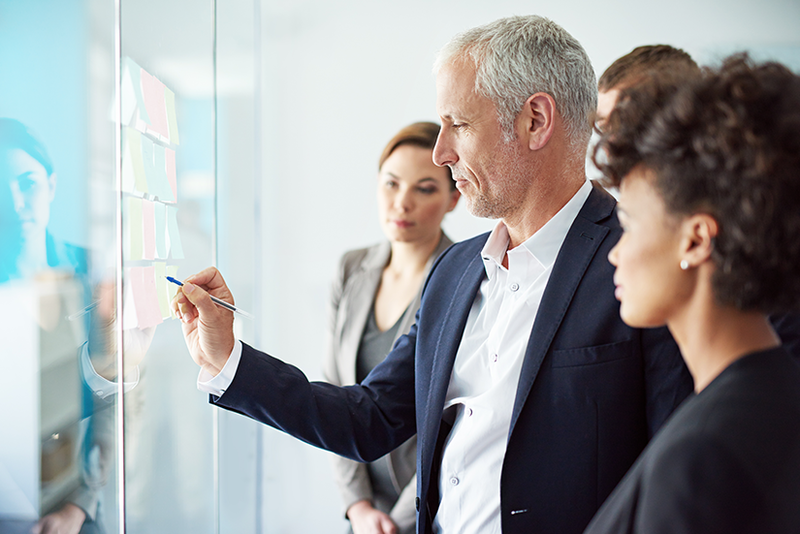 Leverage predictive analytics to determine the optimal execution strategy for any order in any market environment, and determine the best approach to your execution plan to achieve quantifiable, measurable execution improvement. 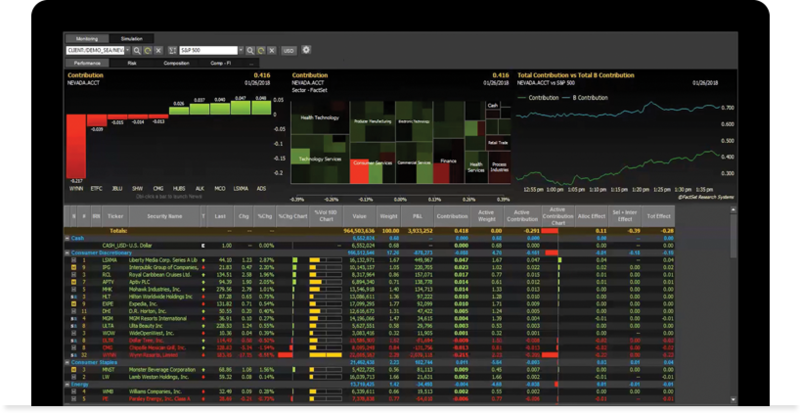 Model portfolios, simulate trades, identify outlying orders, and interact directly with robust visualizations to change, cancel, or execute multiple orders.